Zero. Zilch. 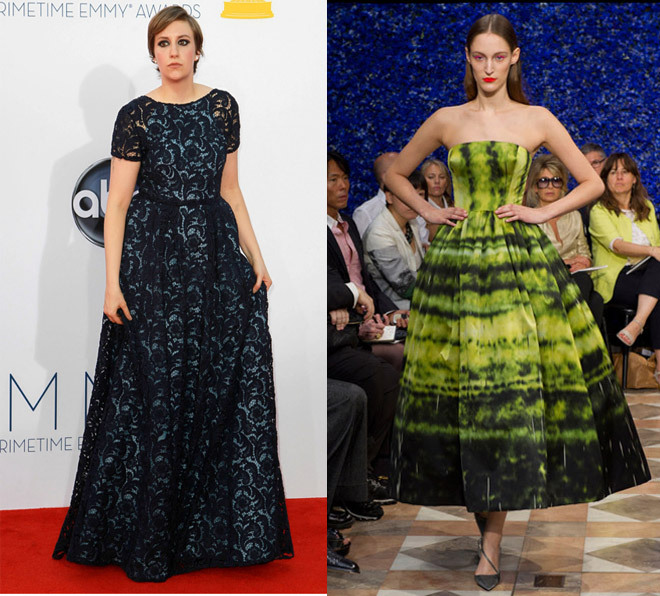 None of my Emmy fashion predictions came through or were even close. Looks like I’ll never get a job on the Psychic Hotline Network. However, other than Claire Danes, I think the three other nominees would have looked a lot better in my picks. What do you think? LENA DUNHAM: Wow. I was pretty shocked by her choice. That dress would make Sofia Vergara look dowdy. I think she should have gone strapless, tea length, with a ’50s-style nipped waist and full skirt in a bright color. ZOOEY DESCHANEL: Her frothy dusty blue gown looked like a prom dress. She reminded me of one of those Disney character princesses who wander around the Magic Kingdom taking photos with tourists. The bodice was ill-fitting too. She needed to get ahold of the Army Corp of Engineers that built Kat Dennings underpinnings. While it wasn’t a disaster, I wish she would have chosen something a little more grown up and less quirky-cute.